You guys will not believe these pieces are from Walmart! They introduced a new collection called Modrn and they really really stepped up their game with this one. Some of these images rival CB2! I cannot attest to the quality, but dang, I would love to get my hands on these pieces and try them out in person! Scroll down to see my favorite picks from the collection. My obsession with dried floral arrangements has been brewing for well over a year. It was last April I did this post touting my love for pampas grass. And just this month, I adorned my bridal show booth and table with a bold statement arrangement of dried flowers by Cass and Jean Flower Co. While prepping for my bridal show, I did a fair bit of sourcing all kinds of dried beauties to use of this and future projects. Outside of local floral supply shops I found the following to be the best resources for dried florals. Afloral has an amazing selection of natural to fun bright colors. 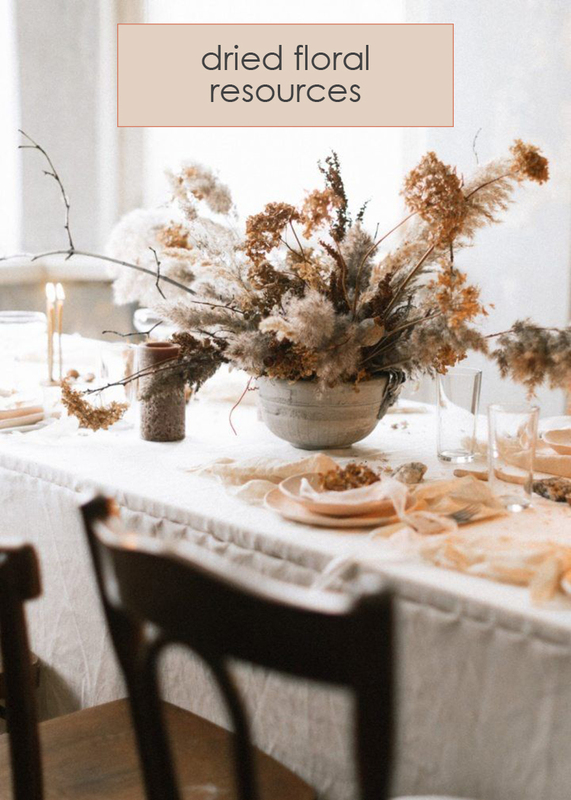 This site could definitely be your one-stop resource for all things dried florals. Do a quick Etsy search for dried florals and you will find inspiration galore! Endless options for any floral style. Michael’s has a more limited selection, but is a great place for dried basics, dried greenery and fillers to combine with fresh or more unique pieces sourced from the sites above. Like Michale’s, Hobby Lobby has a great selection of basics. Plus, like Michael’s they always have coupons and deals so it’s a great place to source those more ubiquitous ingredients for your dried floral recipe. Lisa of Linnaea Floral foraged all the dried, textural flowers for this shoot. I have numerous stems of pampas grass I cut from fields near my home. Keep your eyes open and be ready to pull over. Well, my first trimester has come and gone! I cannot believe how fast its flying by! Still feeling good, my energy is starting to come back. My writing this at 9:22 is evidence of that! Thank goodness! Falling asleep at 9:00PM was cramping my style! I have been craving fruit and fruity candy. All the sour and fruity candy! The first weekend of March I had the pleasure of being part of the unveiling of the beautiful conservatory at Venue3Two. Venue3Two is an old mansion, turned even space that shares property with a horse stable. This place exudes class and has a Gatsby vibe. Could it be anymore magical!? The mansion is perfect for bridal or baby showers and the conservatory seats up to 200 guests. Arielle Teft and Stephanie Parshall captured this beautiful day. I am so excited to share it with you! Windoflower Design Company decked out the horses from Equine Assisted Development for a photoshoot in front of the venue. Gilmore Catering looked divine in enviable kitchen. How stunning would a portrait session look on this staircase!? Windoflower Design Company sprinkled flowers throughout the mansion. Revel Rose put together a stunning tablescape. My friend and fellow wedding planner, Lindsay from Paper Hat, brought the festive balloon vibes. I helped out with massive backdrop and the plexi sign. Finally, Fleurology brought the goods in the conservatory and decked out the huppah from Events by ICandy. Isn’t this place stunning!? I cannot wait to do a wedding here! Thank you again Arielle Teft and Stephanie Parshall for capturing the day! The cane furniture trend has been floating around the internet for a while now, and I am still totally here for it. Last spring I found my gateway drug on Craigslist, a set of classic Breuer chairs. I love the California, Australian surf shack vibes this look gives. Today I have rounded up for you 9 storage pieces with cane details. These pieces can be used as a bar, side board, media stand and more! I am excited to use one of these pieces in the next project I’m planning to tackle. I have to say, my expectations for this room was about the same level of my budget, low. But I am THRILLED with the outcome! I really wasn’t sure what to do with this front “office” room when we first moved in. I had suggestions to make it my office, but I know what a disaster my office turns into on the regular, so I didn’t want my mess right in the front of the house. My long term goal is to connect this room to the kitchen and make it a dining space, but for now we have made it a modern study/workplace for Kyle and once I saw this room by Mandi Johnson of Making Nice in the Midwest, I knew exactly what I wanted to do. I had all of the furniture, most of which is vintage, and I also found the statement pendant that hangs in the center of the room on a trip to an antique shop last year when we were homeless, and I knew eventually the space would present itself. Ta da!! It is the centerpiece of the room and you can see it from the front of our house. For a make-over that didn’t seem all that involved, it looks like a completely different room! Obviously the biggest thing we did was take down the wall paper, add trim and paint the entire room Dusty Miller by Benjamin Moore. Almost every other room in our house is my go-to white, so choosing the perfect green-grey was a really really tough decision, but I am absolutely in love with this color! It really has just the perfect amount of color I was going for here. Painting the shelving, the trim and the doors all in the same monochromatic hue is a bold modern look. See all of my inspiration in this post. I did spend on some accessories. Target’s latest Project 62 collection was exactly the color and vibes I was going for in here. I used lots of books and random accessories I already owned and made several trips to the thrift store for bags and bags and bags of books. On the walls I added a gallery wall with black and white family photos. It is one of the few places I have embraced the personal photos in this house and I adore it here. I also added a pair of affordable prints from Juniper Print Shop. How beautiful are these flowers from Cass and Jean Flower Co!? What do you guys think? Would you paint your wood trim? I’ve been slowly making the shift to clean beauty products for sometime. Currently, all of my shower and body products are clean and still working through some make-up stragglers. You can find my other clean beauty posts here and here. A few months back I was in Chicago and visited the Credo Beauty store. I am obsessed with this place! It’s like being a vegan and going out to a specialty vegan restaurant. You don’t have to ask the waiter a million questions, you know you can eat it, so the whole menu is available to you! That is how I feel about Credo. I don’t have to read every line of the label, because I know they’ve vetted their products and brands. Anyhow I discovered several new products on that visit and have picked up a few others along the way and I want to share my new favorites with you. Maple Holistics Silk 18 Shampoo - I have used a few Maple Holistic shampoos, mostly specialty ones for my dry scalp needs. The Silk 18 shampoo is a new product, the packaging is so clean and simple and it smells amazing. I love how it leaves my hair silky and smooth. Weleda Skin Food - this stuff is amazing! It’s thick, delicious smelling cream for your body, face and hands. I have been putting it on my psoriasis spots along with my prescription and it really seems to be helping. I also used it nightly on my hands and when my face is feeling dry, I even put it there. RMS Beauty Lip Shine in Content - This is my favorite lip product I’ve bought in a long time! FYI, this color “content” is red with a slightly pink hue. It’s not completely opaque and it has a lot of shine, the photo on the website looks much darker than it is in real life. Lily Lolo Mascara - I have tried several clean mascara options, and this is by far my favorite. It goes on smooth, stays on and washes off fairly easily. You guys! We’re creating another human!! We are so excited to finally share this news with you!! It feels like I’ve known forever and I am just so terrible at keeping secrets, so chances are if we had a personal conversation in the past month, I’ve probably told you this news! I am about to answer all your questions, but before that, I just want to give a HUGE thank you to Alyssa McElheney for taking the most precious photos of our growing family!! She is amazing and if you are local to Grand Rapids you should hire her for any of your photography needs. We had been trying for a few months, so it happened pretty quickly, but not nearly as quickly as it happened with Ollie. Speaking of Ollie, he is super excited to tickle the new little baby’s feet and has already been ooo-ing and ahhh-ing over how cute everything baby-related is. He has been hugging and kissing my belly unsolicited and telling me that he’s “giving the baby love.” He also talks about his big brother duties all the time. I know he is going to be amazing!! I am 13 weeks along and due in September! Officially out of my first trimester, so this is going really fast!! Just as with Ollie, I am feeling good. I didn’t have any morning sickness, just some cramps, bloating and discomfort. I feel like I’m showing so much more, so much quicker this time. Before I took the test, right after the holidays, I was so bloated, my favorite high-waisted jeans were feeling so uncomfortable. Needless to say, I had to retire them two months ago! I have been trying to maintain my exercise regimen, however the weather and icy sidewalks has curbed much of my running, which has been really rough for me. So for now, I am riding our in-home exercise bike, doing Tone It Up videos and when I can make it, the classes at the gym. We do plan on finding out what we are having and will do so mid-April. Anything I missed? Ask away! Lauren Koster Creative offers full service design and styling for weddings, events and photoshoots, as well as custom installations, backdrops and decor.